All Austineers will be more than familiar with rust. It’s a pity this process is impractical for large panels but is ideal for smaller parts than can fit into a suitable plastic container. I have only recently heard of this process but it has been around for a long time. Searching the internet with the search terms “electrolytic rust removal” will bring up many articles, mostly published by enthusiastic amateurs, and some of the information you will find is slightly contradictory. I’ll cover the basics of my trials. A source of low voltage DC current – typically a traditional type 12 volt car battery charger. A plastic or glass container, big enough to contain the part that needs treatment. A weak solution of washing soda. A sacrificial anode – a piece of mild steel. Plastic tubs are commonplace in all sizes but a single nut could be treated in a glass jar. The washing soda is the electrolyte – pure water does not conduct electricity but when the soda is added a current can flow. Some articles say baking soda is ok, some say it’s not. I found “Soda Crystals” in the Tesco laundry section and used that. At £1 a Kilo it’s much cheaper than baking soda anyway. No chemical changes occur to the solution during the de-rusting process and but the level will drop as the water content is reduced by electrolysis. After settling out any dross, the solution can be safely poured a drain. The strength of the solution only affects its resistance so I set up the system in clean water and shook the fine soda powder into it, stirring as I went until a small current flowed. A piece of mild steel or common iron makes the anode. One writer uses stainless steel but several warn against it. This will corrode and need cleaning off between sessions – eventually it will have to be replaced. A small part of the anode needs to be cleaned back to bright steel so that a croc clip or other electrical connection can be made. Keep the connection clear of the solution especially if using a croc clip. If you don’t, it will be ruined. Current will flow through the solution across the easiest path so the parts of the piece being treated that are nearest to the anode will be more affected than the more distant parts. Therefore turning and moving the part around may be necessary. 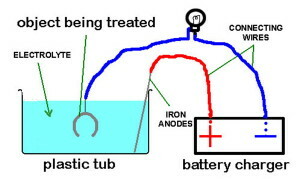 During the process hydrogen and oxygen are released and bubbling will be seen around the anode and cathode. At the low currents I’ve used (typically 0.25 amps indicated by a glimmering 5 watt bulb) hydrogen release is slow and doesn’t seem to be a problem in a workshop space with typical ventilation. If however you try higher currents due take care. At the low currents I’ve used, I find that it takes at least 24 hours to look finished. When you do remove it the part will look black and slimy. It must be immediately rinsed and scrubbed with clean water. I recommend those latex gloves as the stuff stains your hands! Paint or protect the item against future rusting as soon as possible. 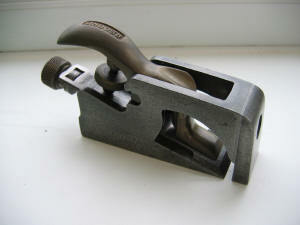 The photograph shows a small block plane that had acquired a patina of rust after being overlooked in the workshop for a couple of years and which has been nicely restored. This process has the advantage of reaching into pitted areas that otherwise might require severe abrasive action to remove. Do a search on the internet and see what others have to say. I am pretty impressed.